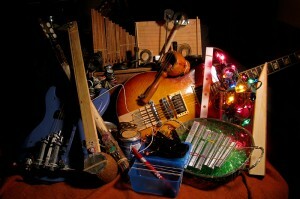 A bunch of my handmade instruments from the Noisy Noises project are going to be exhibited as part of the Scrapcycle show at Devotion Gallery through the end of May. The show opens on Friday May 7th, and the Glass Bees and I will be performing at the opening around 8pm! Bring a used plastic water bottle to barter for admission. 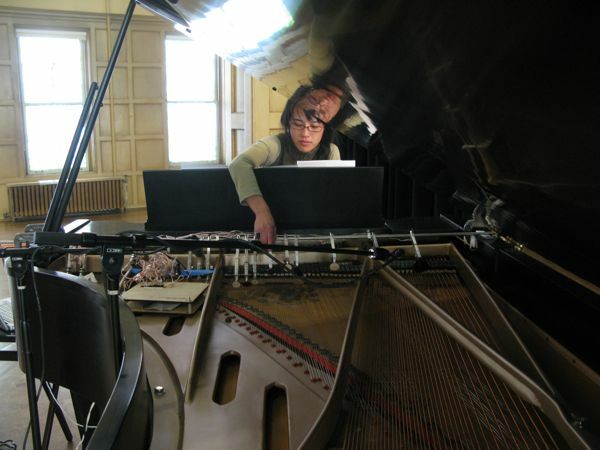 Asami Tamura and I are performing as part of the Music with a View Mini-Marathon at the Flea this Sunday in Tribeca. The show is from 3-6, and it’s free! It should be fun and noisy. Oh, look! Jason and Chris of the Glass Bees posted audio files from our performance at Barbes in March! You can listen here, or go over there where there’s pictures and brief descriptions of each of the pieces. Here’s a video excerpt from the Movable performance! Tiffany Lin ~ Movement 2 from the archiver on Vimeo. Here’s an excerpt from last night’s performance of Zachary James Watkins’ composition “Moveable” for augmented piano. (I built the piano-tickling monster for this performance.) This is just a low quality recording – a much better one will be available later. The full piece is about 75 minutes long; the excerpt is 8 minutes.